Sociologist Vilna Bashi Treitler has a new and especially timely book coming out about race and ethnicity in the US. Look for The Ethnic Project: Transforming Racial Fiction into Ethnic Factions at your local bookstore or at the Stanford University Press table at ASAs. 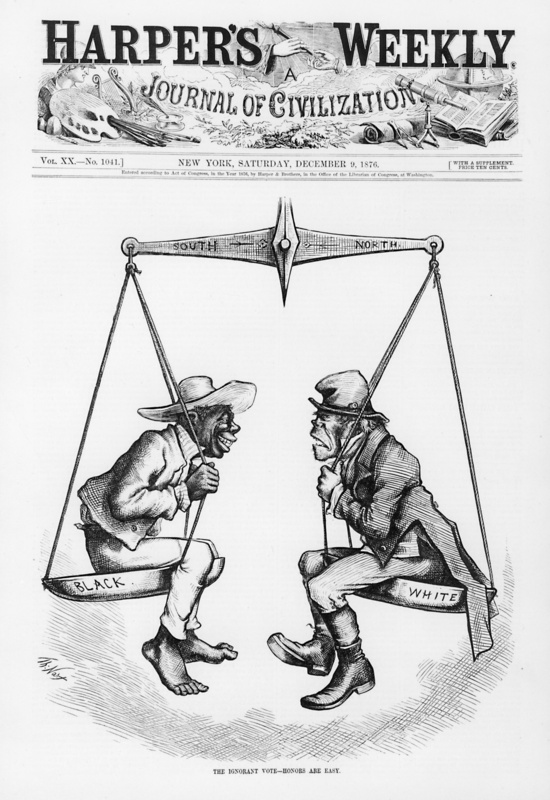 The Ethnic Project analyzes changing depictions of race relations to help readers understand the development and perpetuation of a racial hierarchy in the US. A contemporary cartoon and summary after the jump. “Race is a fiction that people refrain from embracing publicly, but people believe strongly in their ethnicity and use it in self-promoting ways that the author describes as an “ethnic project.” The Ethnic Project shows how destructive ethnic thinking can be in a society that has not let go of racism. It first offers a general explanation of race – what it is, and how it works – and then outlines the structure of race and racial thinking in the United States. The book then traces the ethnic histories of several groups, illustrating that each was incorporated racially into the U.S. social and economic structures, and showing how they fought back by seeking to improve their racial status. Unfortunately, seeking to better a group’s status in a race-based system causes that group to actually strengthen that same racial system. 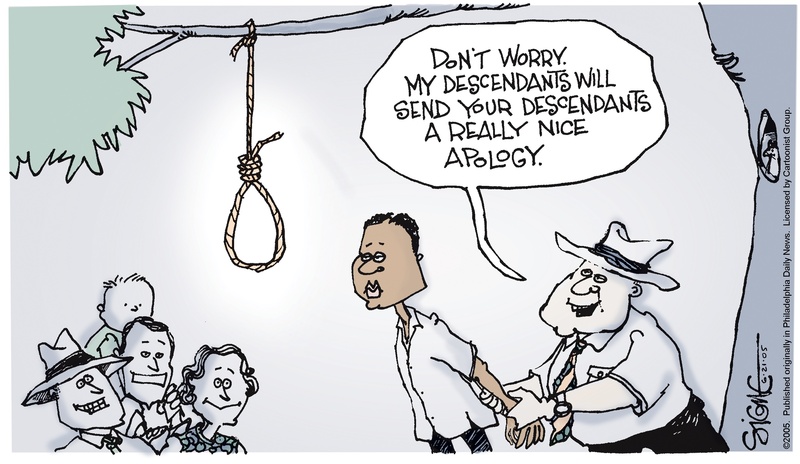 Thus, ethnic thinking (as it has been done in the U.S. since the American Revolution) is shown to reinforce racism. The effect is to shore up rather than dismantle race and racism, to the detriment of all, and the extreme denigration of African Americans. For a contemporary perspective of race relations in work and family, see the author’s ethnography Survival of the Knitted: Immigrant Social Networks in a Stratified World (2007, Stanford University Press). This sounds interesting but it also sounds like the author think that racism can be reduced to one dependent variable, and we can measure whether the value of that variable has remained steady. Doesn’t the upliftment of some racial groups prove that there are different facets to racism, and that it can’t all be reduced to one variable? Reminds me of “How the Irish Became White” by Ignatiev. He basically argues that Irish immigrants distanced themselves from Black Americans (or where openly hostile to them), claimed racial privilege, and reinforced the racial hierarchy in the U.S. Some of the contemporary research on new immigrant assimilation is reminiscent of this point as well. Chris M, you are exactly right, there are different facets to racism and that’s what I set out to say in the book. No single variable reduces race, and the book certainly does not argue anything close to that. In fact, before I offer historical analyses of 13 ethnic groups, I lay out a detailed frame outlining all the facets that comprise a racial paradigm, and throughout the ethnic histories I reference parts of the frame to show how racial paradigms incorporate newcomers without the paradigm being drastically transformed by that incorporation. I hope you read the book and find the paradigmatic frame useful! … And thanks for your comment, someone! I used Ignatiev’s work when discussing the Irish ethnic project, and relied on several historians’ work for my analysis. Their writings showed me that U.S. racial/ethnic history has repeated (and continues to repeat) itself many times over, with the Irish, Italians, Jews, Mexicans, Chinese, Afro-Caribbeans, Cherokee…. Vilna, Thanks for your comment. Although this isn’t the focus of my work per se, I do some research on Asian Americans, and I think I might be able to clarify myself if I focus on the relationship between Asian Americans and Whites. My thesis is that it is easy to project the racial paradigm on data–thus falsifying data (from Asian Americans) are reduced to the status of outliers. As a result the paradigm continues to exist in sociological perceptions but the data themselves don’t necessarily support the paradigm. For instance, Asian American median income surpassed White median income 30 years ago, but the modal American (per my own research) believes that White and Asian median income are equal, and the average American believes that Asians lag behind Whites by a slight amount. Now if the racial paradigm truly existed, one would have expected White income to set a (glass?) ceiling on the income of any non-White group. Given that this isn’t the case, and that this change affects the rank ordering of the four major ethnic groups in America in income–also in education, but that’s tangential–would you not consider that a falsification of the racial paradigm? I understand that the racial paradigm you’re talking about is a social construction, but social constructions have an impact on the real world. So if the paradigm were truly in place (in the socially constructed sphere), I would have expected Asian Americans to lack parity. And are you familiar with Shiao et al.’s The Genomic Challenge to the Social Construction of Race (2012)? Of course most people don’t believe it is a fiction just as they don’t suppose gender is socially constructed or intelligence/success in life may have to do with social capital. I look forward to reading the book! Thanks so much for sharing the announcement and a brief summary. In some research I’ve been doing with my colleague Roger Gonzalez at Brooklyn College we’ve found that students conceive of their ethnic identity in a flexible manner, switching according to context (Cuban at home with the family but just American at work). While we found in discussions that students did not find racial categories particularly meaningful it is interesting to see in responses on a recent survey I gave students when asked how they see themselves (for example, race, ethnicity, religious group, etc.) that so many used racial categories such as African American or Asian. In focus groups with Asian students, for instance, they seemed to say that they did not feel a commonality with other Asians and rather felt Chinese. Korean, etc.). Hi Chris. I’m afraid that I’d have to say that in your example you might be reducing race to a single variable here – that is, the logic of your preceding comment seems to say that if income doesn’t completely reflect racial inequality, then racism or the racial paradigm is falsified. Again, I refer you to the book, where I argue that racial paradigms are complex and not reducible to easily quantifiable variables. I also do not “rank” ethnic groups in a once-and-for-all hierarchy. Paradigms shift with major societal upheavals; but paradigms also adapt to incorporate new themes – as you say, they are socially constructed, and therefore can be continually re-constructed. The “Asian Americans” to whom you refer are a social construction, for example. Who’s “Asian”? Do Pakistani immigrants count? How about Laotians? How about someone with a white American mother and a Japanese father? What about someone with just one Chinese grandparent? Kazakhs? The ethnicity and/or race of these people are all constructs in our mind – they are who they are, but in 1813 the idea of a Pakistani, Laotian, Japanese, Chinese, or Kazakh person is completely different from how those persons would be understood in 1913 or 2013. This changing understanding is what I’m calling the racial paradigm – it is the lens by which people of all geographies and phenotypes are seen, and therefore cannot be “falsified” or made true. People are who they are, and how we see them is how we see them. Of course that is constructed, but constructions can be understood, traced, followed over time and space… and as sociologists we can use our theoretical tools to be historical and societal detectives in the empirical world, and see how these paradigms operate. That is what I tried to do in the book. Thanks so much for having your library order the book – I truly do look forward to continued conversations with you about it! Wow, Veronica – I’m very interested in learning more about your work. It sounds intriguing! That ethnic switching that you noted going on is in my mind a way to manipulate one’s relationship to a racial paradigm – perhaps solidarity-seeking on one side, and working to “fit in” on the other. Fascinating! Vilna, it might help if I you phrase your thesis in a falsifiable way. If X were to disprove your thesis that there is a stable racial paradigm, what would X be? X can be a fact or a set of facts. Also, I know that there is heterogeneity within Asian Americans. Being of Indian descent, I can say with some confidence that South Asians, once they enter the U.S. loosely become part of a single community although Indians and Pakistanis don’t socialize much, they do shop at the same grocery stores and go to the same mosques (if they’re Muslim). And East Asians (excluding Southeast Asians) once they enter the U.S. loosely become part of a single community. However, if you prefer to limit yourself to one community–you can consider any of these communities in isolation consider Chinese, Filipino, Indian and Vietnamese, which collectively make up 75% of the Asians in the U.S. Their median incomes are 65K, 75K, 88K, and 53K respectively. Thus for groups 1,2,3 median income is significantly higher, and for group 4 median income is indistinguishable from White median income.